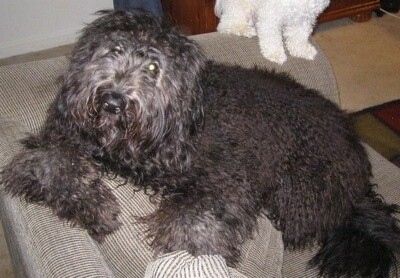 Oscar the Cadoodle (Collie / Poodle mix) at 1 ½ years old—"He is a very loving, fun family pet! He loves to play baseball with my son (Oscar is the outfielder). He is also an avid Frisbee catcher." 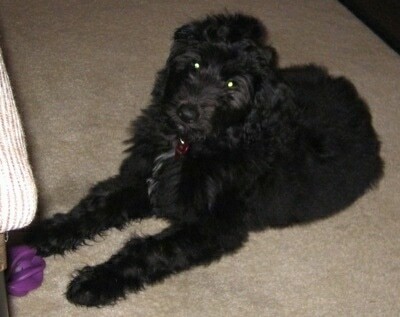 The Cadoodle is not a purebred dog. 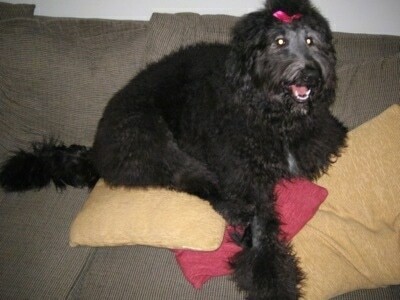 It is a cross between the Collie and the Poodle. The best way to determine the temperament of a mixed breed is to look up all breeds in the cross and know you can get any combination of any of the characteristics found in either breed. Not all of these designer hybrid dogs being bred are 50% purebred to 50% purebred. It is very common for breeders to breed multi-generation crosses. 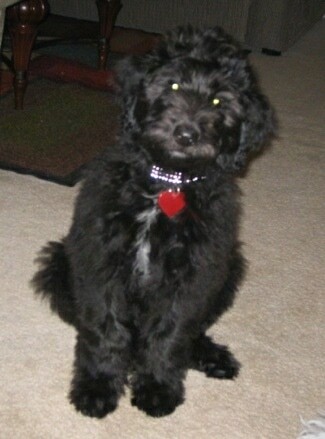 "Juno the black Cadoodle puppy at 2 months old is very smart. She is quickly learning how to be housebroken. She is a bit mischievous. She loves to give kisses, and she is very soft. One quirky thing about our precious Juno is that she loves to splash the water around in her water dish :-)." 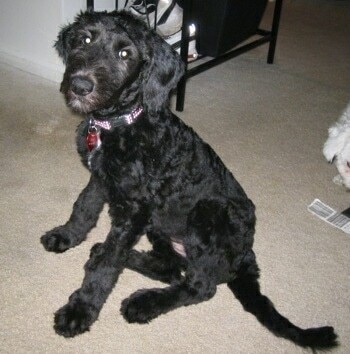 Juno the black Cadoodle puppy at 3 months old after her haircut, weighing 25 pounds—"Juno did not shed at all up until she was 4 months old, then she started to shed quite considerably." 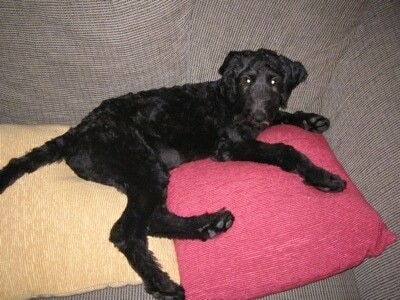 "Juno the Cadoodle after a getting groomed at 8 months old"
"Juno making a mess, which she does so well, at 8 months. 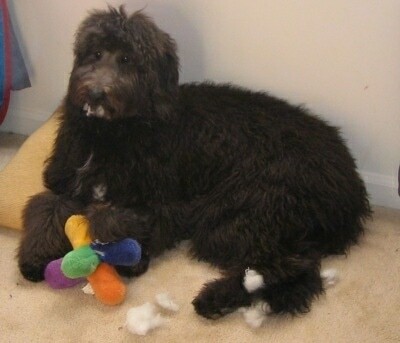 She absolutely loves taking the stuffing out of EVERYTHING!"